They are decidedly not like the straightforwards ones in Thomas Norton’s Ordinal, but are certainly rather figurative, and as such fit with the 15th century vogue of such illustrations that are also seen in thelikes of the Aurora Consurgens, yet are a bit different. 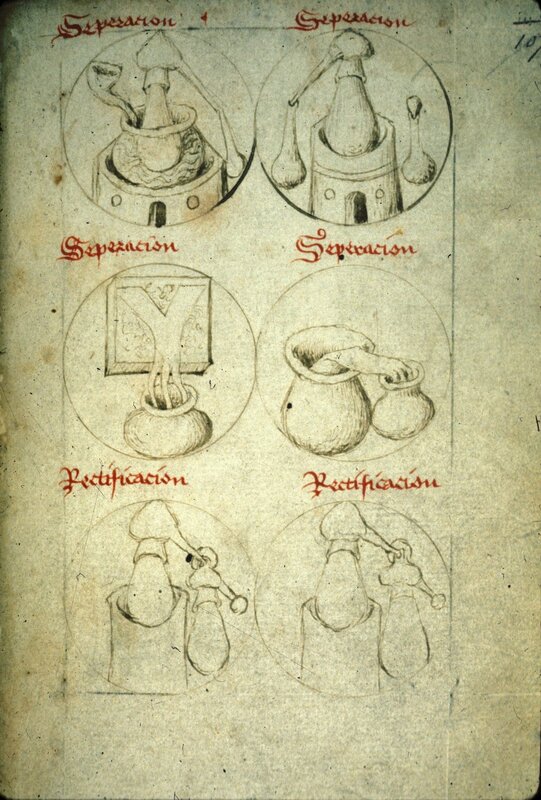 Of course if illustrations like that are found before and outwith the Ripleyan corpus, that makes it clear that more people had more ideas about illustrating aspects of alchemy and perhaps the scrolls were part of a wider culture of alchemical illustrations rather than being the one and only great wonderful thing that appeared out of nowhere. One of the failings of public communication is, often unwittingly, to narrow down the subject by concentrating on the big gaudy obvious stuff. Whereas historians of thelast few decades have spent their time searching out all the less well known things and relationships, so that we have a much broader understanding of what went on and who knew whom and was influenced by them etc. So in this particular case, given the interest in alchemy in England throughout the 15th century (More information is in my book: http://www.newcurioshop.com/alchemy-medieval-tudor-england/) I suspect that there was a wide circle of alchemical people who imbibed both of continental and home grown ideas, out of which came the Ripley scrolls (The early ones of which were of good quality and rather expensive, and I have a short post on them here: ). 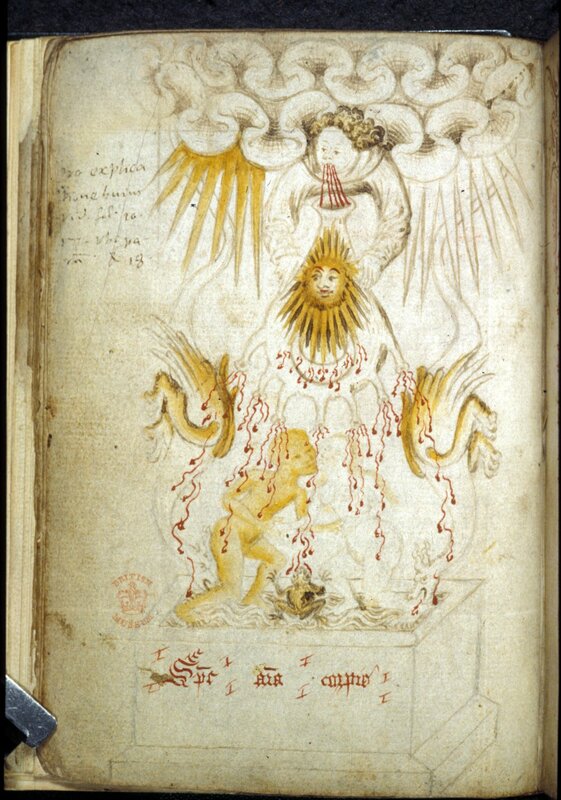 One of the fascinating things about this MS is that it has alchemical and seemingly astrological stuff in it. This is a hoary old debate within study of alchemy, precisely what place astrology has in it, and goes back to the time of Zosimos. The more recent modern look at it is by William Newman and Anthony Grafton in “Ssecrets of Nature – astrology and alchemy in early modern Europe”. It being a while since I have read it, I’m probably not describing their argument well, but basically they say that in the medieval period at least, despite the apparent use of astrology as a bit of a cover for things, it isn’t actually part of the great work, is more misdirection. I think their argument probably doesn’t cover all the relevant sources and something isn’t quite right about it, but I can’t be sure what, yet, due to lack of proper research by myself. It is entirely possible that most alchemists thought alchemy had nothing to do with astrology and yet that some thought it did. 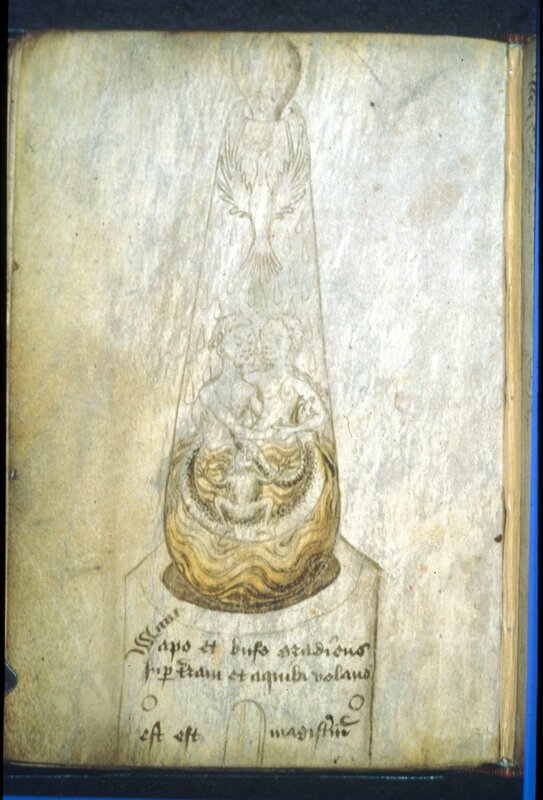 What we can surely say for certain is that both alchemy and astrology involve the study of and interpretation of the natural world, so to find writings on both of them together in the same MS is not surprising at all given that the author or copyist was probably interested in how the world worked. To say more about Harley 2407 I’d have to read it all, but it hasn’t been fully digitised and my MS reading skills are a bit poor at the moment. That air est cibus uignis fownde. The Scala Philosophorum talks about distillation being the activity that rectifies something, but given how different authors use the same words differently depending on the type of alchemy they are doing or how they approach it, I don’t think it worth going into here. Some of the verses in it were printed by Ashmole in his Theatrum Chemicum Brittannicum or so I understand. But anyway, it is a fascinating little book with lots to learn from it. Dorothea Waley Singer, Annie Anderson, and Robina Addis, “Catalogue of Latin and Vernacular Alchemical Manuscripts in Great Britain and Ireland Dating from before the XVI Century”, 3 vols (Brussels: Lamertin, 1928-1931), III, 1040-41. I had access to this catalog many years ago, but back then I was not aware of this manuscript so I did not think about find the entry for it to see if it gives a full description of its contents. I have looked at it a few times in the National library of Scotland, but I can’t recall looking up this MS in particular. Since it is a catalogue, it just has a first line or two and what it thinks the particular work is, but it doesn’t give a full description of anything, IIRC. Catalogs of manuscripts very often contain detailed descriptions of the contents (look for example at Wilson’s “Catalogue of Latin and Vernacular Alchemical Manuscripts in the United States and Canada” and its very detailed descriptions of manuscript contents.) From what I remember, the catalog in question gives incipits and explicits for manuscripts that have multiple texts in them (as long as they can be clearly identified), which might help give an idea of the contents of Harley 2407. Unfortunately, I was not aware of this manuscript back when I had access to that catalog so I never took a look to see what it says about it. Will the BL be scanning more? 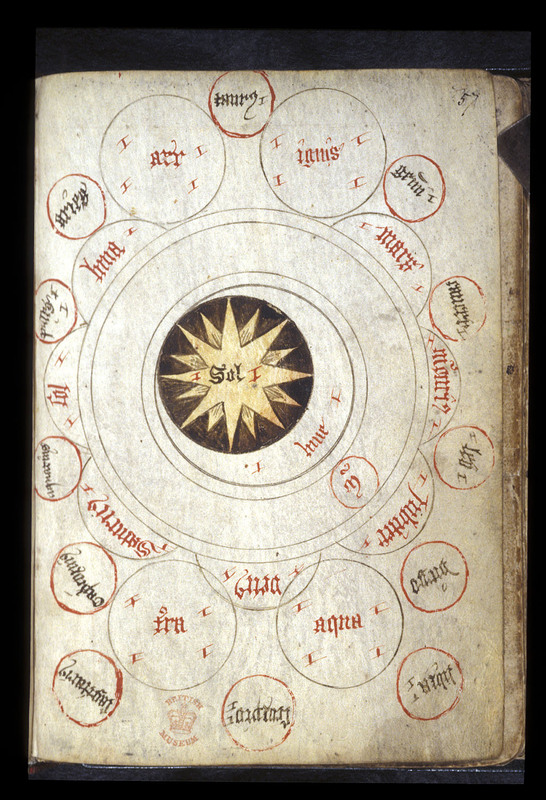 Is the book contemporary to or earlier than the Ripley Scrolls (RS)? It certainly shares very similar imagery to the RS. The RS has elements of collage, using multiple sources of text. Is it that the imagery was collage from multiple sources as well? Do you think the colours have changed? Perhaps as a comparison is the Atalanta Fugiens too? I think the BL is planning on scanning pretty much everything, but I’ve not yet seen a way to persuade them to scan some earlier than others. The Ripley scrolls are, IIRC and pending Jennifer Ramplings new book, late 15th century onwards, i.e. more like 1490’s, so I think Harley 2407 is a bit earlier. The interesting and probably impossible bit would be to tie the english MS into known or suspected circles of alchemists. We know of something of a network earlier in the century, but less later. Cause you always need one. 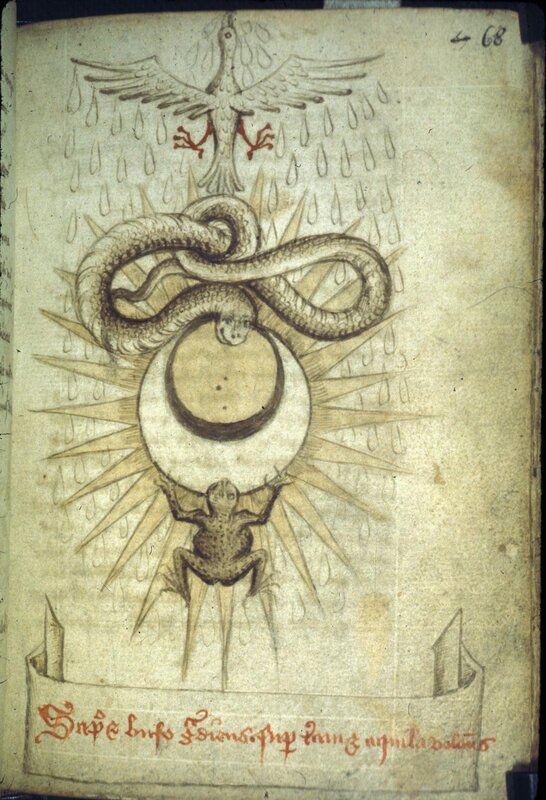 Looks like a french alchemical dictionary to me.